For 2019, a new poll on 180 insurance executives ranks four out of five of last year’s top risks again in the top 5. Several psychologists stated that economists were rational and those who didn’t know what economists knew were irrational. They collected data on how irrational folks are and analyzed that data and grouped it and gave cute names to various groups. But I think that you could do the same thing with long division. Certainly with calculus. Compare answers of rubes on the sidewalk to math PhD s on a bunch of math questions and how well do you think the rubes would do? Some of the questions that the psychologists asked were about risk. They proved that folks who rely solely on their gut to make decisions about risk were not very good at it. I am sure that no-one with any Risk Intelligence would have bet against that finding. Because Risk Intelligence consists of more than just trusting your gut. It also requires education regarding the best practices for risk management and risk assessment along with stories of how well (and sometimes ill) intentioned business managers went wrong with risk. It also requires careful analysis. Often statistical analysis. Analysis that is usually not particularly intuitive even with experience. But Risk Intelligence still needs a well developed gut. Because history doesn’t repeat, analysis always requires simplification and assumptions to fill out a model where data is insufficient. Only with all of Education, Experience and Analysis is Risk Intelligence achievable and even then it is not guaranteed. And in addition, Education, Experience and Analysis are the cure for the irrational biases found by the psychologists. I would bet that the psychologists systematically excluded any responses from a person with Risk Intelligence. That would have invalidated their investigation. Their conclusion could have been that many of us need basic financial and risk education, better understanding of how to accumulate helpful experiences and some basic analytical skills. Not as much fun as a long list of cutely names biases, but much more helpful. Did the Three Pigs have different Risk Tolerances? Or did they just have a different view of the degree of risk in their environment? Think about it? Is there any evidence that the first pig, whose house was made off straw, was fine with the idea of losing his house? Not really. More likely, he thought that the world was totally benign. He thought that there was no way that his straw house wouldn’t be there tomorrow and the next day. He was not tolerant of the risk of losing his house. He just didn’t think it would happen. But he was wrong. It could and did happen. The second pig used sticks instead of straw. Did that mean that the second pig had less tolerance for risk than the first pig? Probably not. The second pig probably thought that a house of sticks was sturdy enough to withstand whatever the world would send against it. This pig thought that the world was more dangerous than the first pig. He needed sticks, rather than straw to make the house sturdy enough to last. He also was wrong. Sticks were not enough either. That third pig has a house of bricks. That probably cost much more than sticks or straw and took longer to build as well. The third pig thought that the world was pretty dangerous for houses. And he was right. Bricks were sturdy enough to survive. At least on the day that the wolf came by. The problem here was not risk tolerance, but inappropriate parameters for the risk models of the first two pigs. When they parameterized their models, the first pig probably put down zero for the number of wolves in the area. After all, the first pig had never ever seen a wolf. The second pig, may have put down 1 wolf, but when he went to enter the parameter for how hard could the wolf blow, he put down “not very hard”. He had not seen a wolf either. But he had heard of wolves. He didn’t know about the wind speed of a full on wolf huff and puff. His model told him that sticks could withstand whatever a wolf could do to his house. When the third pig built his risk model, he answered that there were “many” wolves around. And when he filled in the parameter for how hard the wolf could blow, he put “very”. When he was a wee tiny pig, he had seen a wolf blow down a house built of sticks that had a straw roof. He was afraid of wolves for a reason. Is that so? Well, only if you live in a textbook. And RISKVIEWS has not actually checked whether there really are text books that are that far divorced from reality. The reason why it is necessary to engage nearly everyone in the risk management process is that it is very difficult to distinguish among those and other possibilities. Risk without reward describes many operational risks. Reward without risk is the clear objective of every capitalist business. Modern authors call it a persistent competitive advantage, old school name was monopoly. Reward without risk is usually called rent by economists. Risk with too little reward is what happens to those who come late to the party or who come without sufficient knowledge of how things work. Think of the poker saying “look around the table and if you cannot tell who is the chump, it is you.” If you really are the chump, then you are very lucky if your reward is positive. Risk with just the right amount of reward happens sometimes, but only when there is a high degree of flexibility in a market – especially no penalty for entry and exit. Sort of the opposite of the airline industry. Concentration, defined broadly, is the source of all risk. In an unconcentrated pool of activities, all with potential for positive and negative outcomes, provides the Big D – Diversification. So it seems simple to avoid C – just do D.
But we have so many ways to concentrate. And concentration is particularly tempting. When things are going well, it makes sense to do more of whatever it is that is working best. That increases concentration. Once we learn how to do something right, it makes sense to do more. That increases concentration. One supplier is almost always the cheapest, fastest and best quality. So we give them more business. That increases concentration. That one product has better margins than the rest and it sells better too. So we plan to increase our capacity to make that product. That increases concentration. Our best distributor runs rings around the rest. We are working on giving her a larger territory. That increases concentration. The alternative, the diversifying alternative just doesn’t sound so smart. Hold back when things are going well. Do more of the things that you haven’t quite mastered. Buy from the second and third best suppliers. Keep up capacity for the lower margin lower selling products. Restrict your best distributor from selling too much. Remember Blockbuster? There were Blockbuster stores everywhere fifteen years ago. They did that one thing, rent physical videos through physical stores and did it so well that they drove out most of their competition. But they were totally Concentrated. When they were faced with a new competitor, Netflix, the CEO proposed changes to their business practices, including diversifying into online rentals. Their board decided against going into a new lower margin product and fired the CEO. Five years later, Blockbuster was toast. Concentration risk is often strategic. Why is concentration risk so deadly? The answer to that is pretty simple arithmetic. If your conglomerate amounts to four similar sized separate divisions that do not interact so much, it is quite possible that if one of those businesses fails, that the conglomerate will be able to continue operating – wounded but fully able to operate the other three divisions. But if your cousin’s venture has just one highly profitable, highly successful business, then his venture will either live or die with that one business. In insurance, we see this concentration risk all of the time. If you are an insurer that only writes business throughout the Pacific islands in the 1700’s, but you find that your best salesperson is on Easter Island and your highest margin product is business interruption insurance for the businesses that do the carving of the massive Moai statues. So you do more and more business with your best salesperson selling your best product, until you are essentially a one product, one location insurer. And then the last tree is used (or rats eat the roots). All of your customers make claims at once. You thought that you were diversified because you had 300 separate customers. But those 300 customers all acted like just one when the trees were gone. So diversification is not just about counting. It is about understanding the differences or similarities of your risks. And failure to understand those drivers will often lead to dangerous concentration. Just ask those banks or that Easter Island insurer. So Berkshire is prepared to pay out claims on an event that is three times as large as anything that has ever happened. What are Berkshire’s competitors prepared for? Swiss Re’s risk tolerance is an expression of the extent to which the Board of Directors has authorised the Group and Business Units’ executive management to assume risk. It represents the maximum amount of risk that Swiss Re is willing to accept within the constraints imposed by its capital and liquidity resources, its strategy, its risk appetite, and the regulatory and rating agency environment within which it operates. Risk tolerance criteria are specified for the Group and Business Units, as well as for the major legal entities. A key responsibility of Risk Management is to ensure that Swiss Re’s risk tolerance is applied throughout the business. As part of this responsibility, Risk Management ensures that our risk tolerance targets are a key basis for our business planning processes. Furthermore, both our risk tolerance and risk appetite – the types and level of risk we seek to take within our risk tolerance – are clearly reflected in a limit framework across all risk categories. The limit framework is approved at the Group EC level through the Group Risk and Capital Committee. The individual limits are established through an iterative process to ensure that the overall framework complies with our Group-wide policies on capital adequacy and risk accumulation. So they have a number but they are not saying what it is. But they are telling us what they do with that number. Now here is the Risk Limit Framework from the 2013 Partner Re annual report. They have a number and here it is. But look at how much more Buffet has disclosed. He told that for Berkshire, an event that is three times the largest event experienced by the insurance industry, the loss would be significantly less than the earnings from the investments of Berkshire’s insurance and reinsurance companies plus the earnings of its non-insurance businesses. Partner Re, whose disclosure is light years more specific than almost any other (re)insurer, is not quite so helpful. It is good to know that they have the disclosed limits, but they have not provided any information to tell us how much that this adds up to in their mind. 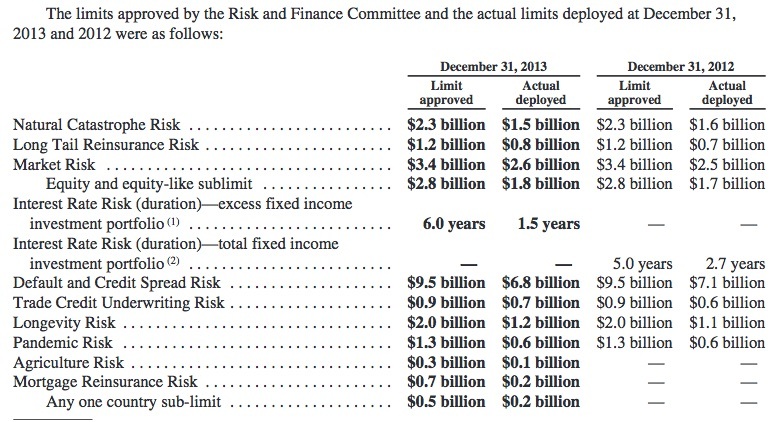 If RISKVIEWS adds them up, these limits come to $21.5B. Adding like that is the same as assuming that they all happen at once. If we make the opposie assumption, that they are totally independent, we get a little more than $10B. Partner Re’s capital is $7.5B. So when they accept these risks, they must not think that it is likely to pay out their full limit, even on a fully diversified independent risk scenario. So even with more specific disclosure than almost any other insurer, Partner Re has not revealed how they think of their risk appetite. On the other hand, while Berkshire has given a better sense of their risk appetite, Buffett hasn’t revealed any number. But this seems to RISKVIEWS to be real progress. Perhaps some combination of these three disclosures would be the whole story of risk appetite at a (re) insurer. We shall wait and see if somehow this evolution continues until investors and policyholders can get the information to understand how well prepared a (re) insurer is to pay its claims and remain in business in a extreme situation. We give much too little consideration to potential for conflict of interest in risk reporting. Take for instance weather risk reporting. Many of the people who report on Weather Risk have a financial interest in bad weather. 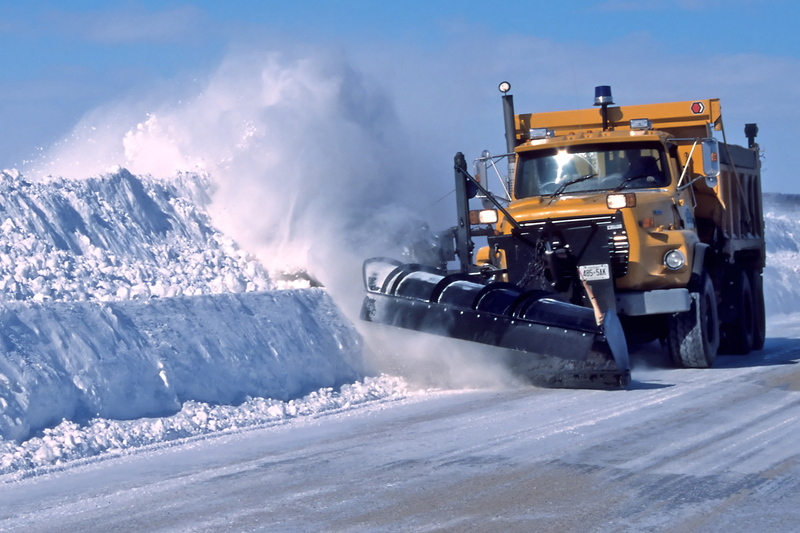 Not that they own snow plowing services or something. But take TV stations for example. Local TV station revenue is largely proportional to their number of viewers. Local news and weather are often the sole part of their schedule that they produce themselves and therefore get all or almost all of the revenue. And viewership for local news programs may double with an impending snowstorm. So they have a financial interest in predicting more snow. The Weather Channel has the same dynamic, but a wider area from which to draw to find extreme weather situations. But if there is any hint of a possible extreme weather situation in a major metropolitan area with millions of possible viewers, they have a strong incentive to report the worst case possibility. For the Big Apple, the great Blizzard of 2015 was forecast to rival the paralyzing 1888 storm, dubbed the White Hurricane. Up to three feet of snow was predicted. Reality: About 10 inches fell. The forecast in Philadelphia wasn’t any better – and arguably worse. Up to 14 inches of snow were forecast. The City of Brotherly Love tallied roughly 2 inches, about the same as Washington, D.C. In other cases, we go to the experts to get information about possible disasters from diseases. But their funding depends very much on how important their specialty is seen to be to the politicians who approve their funding. In 2005, the Bird Flu was the scare topic of the year. Needless to say, the funding for health systems can be strongly impacted by the fear of such a pandemic. At them time that statement was made, worldwide Bird Flu deaths were slightly over 100. Not 100 thousand, 100 – the number right after 99. But the purpose of this post is not writing this to disparage weather reporters or epidemiologists. It is to caution risk managers. Sometimes risk managers get the idea that they are better off if everyone had more concern for risk. They take on the roll of Dr. Doom, pointing out the worst case potential in every situation. This course of action is usually not successful. Instead of building respect for risk, the result is more often to create a steady distrust of statements from the risk manager. The Chicken Little effect results. Instead, the risk manager needs to focus on being painstakingly realistic in reporting about risk. Risk is about the future, so it is impossible to get it right all of the time. That is not the goal. The goal should be to make reports on risk that consistently use all of the information available at the time the report is made. Normal Volatility (as in within). Each risk should have a range of favorable and unfavorable outcomes within the range of normal volatility. This could mean within one standard deviation, or with a 1 in 10 likelihood. So normal volatility for the road that you drive to work might be for there to be one accident per month. Realistic Disaster Scenario. This might be the worst situation for the risk that has happened in recent memory, or it might be a believable bad scenario that hasn’t happened for risks where recent experience has been fairly benign. For that road, two accidents in a week might be a realistic disaster. It actually happened 5 years ago. For the similar road that your spouse takes to work, there haven’t been any two accident weeks, but the volume of traffic is similar, so the realistic disaster scenario for that road is also two accidents in a week. Worst case scenario. This is usually not a particularly realistic scenario. It does not mean worst case, like the sun blowing up and the end of the solar system. It does mean something significantly worse than what you expect can happen. For the risk of car accidents on your morning commute, the worst case might be a month with 8 accidents. So the 150 million number above for flu deaths is a worst case scenario. As were the Great Blizzard predictions. What actually happened was in line with normal volatility for a winter storm in those two cities. If you, the risk manager, learn to always use language like the above, first of all, it will slow you down and make you think about what you are saying. Eventually, your audience will get to learn what your terminology means and will be able to form their own opinion about your reliability. And you will find that credibility for your risk reporting has very favorable impact on your longevity and compensation as a risk manager.